The Meaning of the Scout Oath . . . . . . . . When you say "On my honor," that's like saying "I promise." It also means you are the kind of person who always tries to do what is right and you can be trusted to keep this promise. No one can take your honor from you, but you can throw it away by breaking your promise and doing what you know is wrong. Notice that the Scout Oath has three basic parts. Let's look at what they mean. Your family and religious leaders teach you to know and serve God. By following these teachings, you do your duty to God. Men and women of the past worked to make America great, and many gave their lives for their country. By being a good family member and a good citizen, by working for your country's good and obeying its laws, you do your duty to your country. Obeying the Scout Law means living by its 12 points. The Scout Law is explained below. Many people need help. A cheery smile and a helping hand make life easier for others. By doing a Good Turn daily and helping when you're needed, you prove yourself a Scout and do your part to make this a better world. Keeping yourself physically strong means taking good care of your body. Eat the right foods and build your strength. Staying mentally awake means learn all you can, be curious, and ask questions. Being morally straight means to live your life with honesty, to be clean in your speech and actions, and to be a person of strong character. The Meaning of the Scout Law . . . . . . . . The Scout Law has 12 points. Each is a goal for every Scout. He does his best to live up to the Law. It is not always easy to do, but a Scout always tries. A Scout tells the truth. He keeps his promises. Honesty is part of his code of conduct. People can depend on him. A Scout is true to his family, friends, Scout leaders, school, nation, and the community of the world. A Scout is concerned about other people. He does things willingly for others without pay or reward. A Scout is a friend to all. He is a brother to other Scouts , and all the people of the world. He seeks to understand others. He respects those with ideas and customs other than his own. A Scout is polite to everyone. He knows that good manners make it easier for people to get along together. A Scout understands there is strength in being gentle. He treats others as he wants to be treated. He is not cruel to living things . A Scout follows the rules of his family, school, and troop. He obeys the laws of his community and country. If he thinks these rules and laws are unfair, he tries to have them changed in an orderly manner rather than disobeying them. A Scout looks for the bright side of things. He cheerfully does tasks that come his way. He tries to make others happy. A Scout works to pay his way and to help others. He saves for the future . He protects and conserves natural resources. He carefully uses time and property. A Scout can face danger even if he is afraid. He has the courage to stand for what he thinks is right even if others laugh at him or threaten him. A Scout keeps his body and mind fit and clean. He admires those who believe in living by these same ideals. He helps keep his home and community clean. A Scout is reverent toward God. He is faithful in his religious duties. He respects the beliefs of others. The Scout motto is "Be Prepared." Someone once asked Baden-Powell, the founder of Scouting, "Be prepared for what?" Baden-Powell replied, "Why, for any old thing." That's just the idea. The Scout motto means that you are always ready to do your duty and to face danger, if necessary, to help others. "DO A GOOD TURN DAILY"
This does not mean that you are supposed to do one Good Turn during the day and then stop. On the contrary - it means you do at least one Good Turn a day. It means looking for opportunities to help and then helping, quietly and without boasting. Remember always that a Good Turn is an extra act of kindness, not just something you do because it is good manners. The Scout sign identifies you as a Scout anywhere in the world. Use it whenever you give the Scout Oath or Scout Law. The three upraised fingers stand for the three parts of the Scout Oath. The thumb and little finger together stand for the bond between all Scouts. 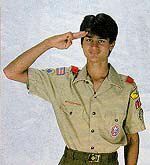 The Scout salute signifies respect and courtesy. You use it to salute the flag of the United States of America. During some ceremonies, you may also salute your Webelos leaders or Boy Scout leaders. To give the Scout salute, place the fingers of your right hand in position as for the Scout sign. Bring the hand smartly up to your head, palm sideways, until your forefinger touches the edge of your cap above the right eye or, if you are capless, your forehead above the right eye. When the salute is completed, snap your hand down quickly to your side. To give the Scout handclasp, use your left hand instead of the right. Do not interlock your fingers. The Scout handclasp is a token of friendship. That's why you use your left hand-the one nearest your heart. When we speak of the Scout badge, we mean the badge of the First Class Boy Scout. It is shown here. The three-point design of the top half of the badge is like the north point of the old sailor's compass. The main part of the badge shows that a Scout is able to point the right way in life as truly as the compass points it in the field. The three points, like the three fingers in the Scout sign, stand for the three parts of the Scout Oath to which a boy pledges himself as a Boy Scout. The stars symbolize the ideals of truth and knowledge of the Scouting movement. They guide you by night and suggest a Scout's outdoor life. The eagle with the shield is the national emblem of the United States of America. It stands for freedom and readiness to defend that freedom. The scroll with the Scout motto is turned up at the ends to suggest the corners of a Scout's mouth raised in a smile as he does his duty. The knot attached to the bottom of the scroll is to remind you that, as a Boy Scout, you promise to do a Good Turn for someone every day.